2 Versions included: Pythagorean Theorem problems (diagrams & word problems), and Unit Rates & Proportions (multiplication patterns, cross-multiply, fraction to percent, unit rates and prices). 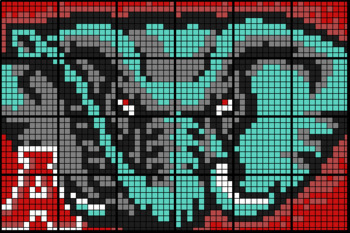 This is a highly engaging task, as it provides collaborative motivation to complete the practice problems... every students' worksheet is a small part of the large elephant mosaic! Check out the product preview to see sample worksheets and to see how this product works! They use their answers to colour-by-number their section of the big mosaic. Be sure the check out the whole Collaborative Math Mosaic directory, sorted by topic! The student buy-in factor is HUGE with these worksheets; they all want to see the finished picture come together! All my colouring worksheets use standard pencil-crayon colours found in the Crayola 24 pack. For best results, encourage DARK colouring, and stick to one colouring medium. (i.e. don't mix pencil crayons with markers with finger paint!) Perhaps a class set of pencil crayons would be a fun math department investment!